Squirrels are members of the family Sciuridae, consisting of small or medium-size rodents. The family includes tree squirrels, ground squirrels, chipmunks, marmots, flying squirrels, and prairie dogs. Squirrels are indigenous to the Americas. Fox Squirrels – Fox Squirrels are the largest tree squirrels. The fox squirrel is a large tree dwelling squirrel with reddish underpants and rust or brown colored under parts. Its tail, a mixture of cinnamon and black hairs, is generally about half the length of its body. They have four sets of whiskers. Abert Squirrels – Abert squirrels range in weight from 1 to 2 pounds and have tufts of fur that extend out from the tops of their ears. Their colors change; from gray with a white belly to being all black. Pine Squirrels – Pine squirrels are one of the smallest tree squirrels weighing between 4 to 8 ounces. They are generally reddish-brown with a greyish-white belly, and a black lateral line which runs down their sides. Bubonic and Pneumonic Plague – When populations are dense, small rodents such as rats, mice, and squirrels are susceptible to the plague, which has wiped out entire colonies. Although rare, people can contract bubonic and pneumonic plague from a bite or scratch from infected animals. People who handle tissue from infected animals or have other exposures to infected animals are at increased risk. Fleas that live on these animals become infected, too, so people may get the bacteria from flea bites. The only form of this disease that can be passed from one person to another is pneumonic plague. Squirrels will usually nest in trees, using them for food and protection from predators and the elements. However, oftentimes they will take up residence in a building if access to sheltered areas such as eaves and attic crawl spaces is available. Audible gnawing, scratching, and pattering sounds, in early morning or daylight hours, usually signal their presence. Balls of torn insulation, cardboard, and dried leaves and twigs may pinpoint nests, but nests and young may be totally concealed within eaves or wall spaces. Squirrels in house eaves and attics can damage insulation and electrical wiring and should be removed. Digging in lawns, eating ornamental plants and bulbs, and stealing food from bird feeders are also common behaviors of squirrels. 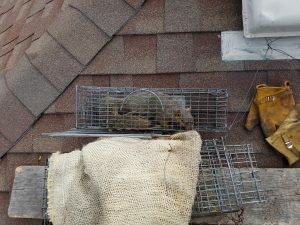 To assure that the nuisance squirrels do not re-open or create new entry points the animals causing the problem should always be removed, and then the holes sealed up to prevent others from infesting the structure. Remove any food source for the squirrel that might be in your yard. Purchase squirrel-proof bird feeders. Feeders will attract squirrels. Keep your yard clean from all trash and food scraps. Squirrels will eat almost anything, and they will stay around your home or business if they think they will find food. It is not uncommon for a squirrel or family of squirrels to take advantage of a small opening and make your house their new home. A qualified ADC wildlife professional will find the entry point that the squirrel is using to enter the structure. 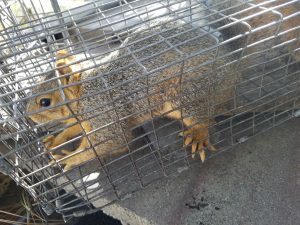 Once the entry hole(s) are located, cage traps will be set in a location most likely to catch only the nuisance squirrels. We will monitor the traps regularly. However to reduce the stress on a trapped animal, we do ask that the home or business owner call ADC if a squirrel gets trapped between our visits. When we are confident the problem squirrels have been removed the entry point holes need to be patched. This is a very important step as a new family of squirrels, birds, or bats might use the holes to enter the structure.